If you've been looking for a way to spice up your exercise regimen (and you also happen to have a VR headset lying around), you're in luck. VirZOOM, the company behind the $400 "VZ Bike Controller" -- a full-sized exercise bike designed to work with VR headsets out-of-the-box -- just announced a new VR exercise peripheral at E3 this year, called the "VZ Sensor." The VZ Sensor is a small, $90 device that hooks directly onto any stationary exercise bike's crank, essentially turning it into a standard VirZOOM bike but without the extra expenditure. Naturally, this makes the device ideal for anybody who either already owns their own exercise bike or uses one at their local gym, so long as said gym doesn't have a strict "no funky-looking goggles" policy. 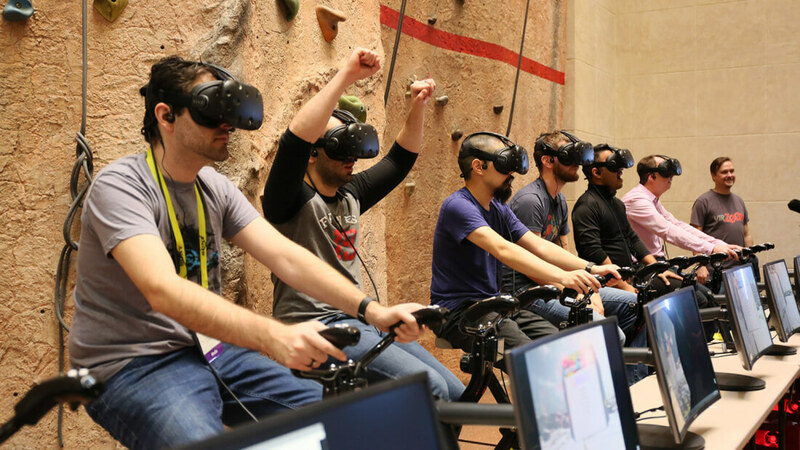 VirZOOM is a small startup that's attempting to combine virtual reality with exercising using the company's 7 available VR titles, which range from standard biking all the way to Pegasus riding or helicopter piloting. They offer a free SDK as well. The portable nature of the VZ Sensor and the more accessible pricing should open this up to more potential users than the company's previous full-sized bike offering, but there are a few drawbacks. For example, certain games will require a controller to be held (the full-sized VirZOOM bike includes built-in controllers) and users will still need to shell out the extra dough for a VR headset, to begin with. Speaking of VR headsets, the VZ Sensor will be supporting most of the major headset options out there currently - PlayStation VR, Samsung Gear VR, the HTC Vive, and the Oculus Rift, specifically with Google Daydream compatibility coming down the line. All things considered, the VZ Sensor is certainly an interesting idea. And, if any of the E3 testimonials out there are anything to go by, it should also be quite fun to use. The VZ Sensor doesn't have a final release date yet, but it's meant to arrive sometime this Fall.